Yachting Monthly’s first ever electronic supplement is launched today and it covers the wrecking antics of technical editor Chris Beeson and his crew of ship-breakers who demonstrate that worse things really do happen at sea. 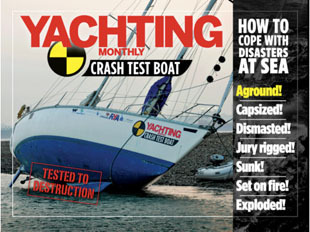 The Yachting Monthly Crash Test Boat App takes the viewer through all the disasters which can overtake sailors afloat: dismasting, jury rig, grounding, fire, capsize, hole-in-the-hull, seacock failure and gas cooker explosion. The yacht which was subjected to this boating blitz was Fizzical a Jeanneau Sun Fizz 40 ketch, and her remains – following the final gas explosion off the Isle of Wight – will be on display at the London Boat Show in ExCel from 6-15 January 2012.